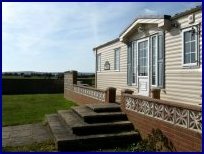 This 2 bedroom mobile home is situated on a small, but popular site in a lovely rural Hampshire location. It has beautiful views across the Solent to the Isle of Wight. It is possible to walk across Pennington Marshes to the coastal path which runs from Lymington Marina to Keyhaven and on to Hurst castle or the beach at Milford on Sea. It is ideal for walkers, bird watchers or those who just want to explore the New Forest National Park, the lovely beaches along the south coast or the nearby towns of Lymington, Christchurch, Bournemouth and Southampton, and the villages of Brockenhurst and Beaulieu. It is possible to take a ferry to the Isle of Wight from Lymington. There is a laundry and reception office, and in high season, a shop and mobile café for snacks and breakfast. There is a children's play area and both children and adults enjoy the relaxed atmosphere of the site. It is only a short trip to Paultons Amusement Park or Montague Abbey and Motor Museum, at Beaulieu. This area is a very popular camping destination for families who enjoy the countryside and outdoor pursuits. 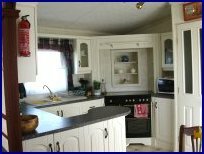 The caravan has 2 bedrooms and is fully equipped for 4 people. We provide pillows and duvets but you are required to bring your own bedlinen, towels and tea towels. 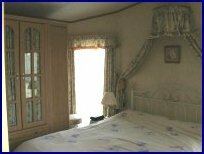 The large double bedroom has a full size double divan bed and fitted wardrobes as well as its own en suite toilet. The smaller twin bedroom has two single beds and is next to the toilet/shower room. The kitchen has an oven, hob, microwave, dishwasher and fridge freezer. 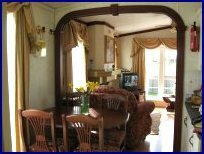 The lounge/diner has a full size three piece suite, TV, music centre, and a picture window with views to the Needles and Hurst castle. Wireless Internet is available, free of charge. A 20% (minimum £50) deposit is required to secure your booking and full payment, is required 8 weeks before your holiday. Weekly rentals are usually Saturday to Saturday, but other days can be arranged. You may arrive and pick up your key between 2pm and 8pm on your first day, and must leave by 10am on your departure day to enable cleaning to take place before the next booking. A security deposit of £100 is taken with your full payment, against damages and key return. This will be returned by post, after the cleaners have checked the caravan, by approx one week after your holiday. When you make your booking, by phone or email, you will be advised how to send your payment. You will almost certainly arrive via Lyndhurst and Brockenhurst on the A35. As you come into Lymington, go straight on through several small roundabouts, until you get to the traffic lights at Lymington police station. Go straight on here and pass the Waitrose Supermarket on your right, then keep right on the one way system, but immediately get into the left hand lane for Pennington. Go down the hill to the first roundabout and turn left after the pub then immediately right into Lower Pennington Lane. 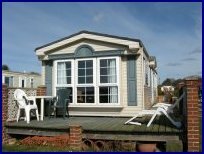 My Caravan Holiday New Forest blog on Blogger has lots more pics and details of the leisure and tourism in the New Forest area. You should bring your own sheets, pillow cases, duvet covers, towels and tea towels. There are 2 single summer duvets and blankets, and a double winter duvet and summer duvet. There are ample pillows. I keep my personal linen in the caravan but would prefer that you do not use it. If you do you will be charged £30 which I will deduct from your security deposit (this is the amount my cleaner charges for laundry). There are cushions for the garden furniture under the left hand single bed. When the caravan is empty I turn off everything at the power points. The gas is left on but the cooker will not work unless you switch on the ignition switch on the wall next to it, and lift the glass lid. The power point for the microwave is behind it, and the one for the fridge/freezer is on the wall next to the kitchen door and light switch. There are instruction manuals for all electrical equipment in the ring binder in the cupboard next to the fridge. There is an iron and built in ironing board. The TV will also be switched off at the power switches behind it. You can get the four terrestrial stations on 1-4. There is a Sky digital box which is not receiving well, but you may get the free ITV and Sky channels on it on AV 0. The music centre has built in speakers in every room and you can elect whichever room you are in from a panel on the wall next to the mirror. The thermostat is on the lounge wall and the programmer is in the hall cupboard.